Saga, Jake Anderson, Seattle Shipyard, Deadliest Catch Crab Boat, Lake Union, Dry in the Shipyard, Spring action before summer salmon tendering, Photography By: Salty Dog Boating News, Salty Dog Maritime Marketing, The Pacific Northwest to Alaska Marine Traffic Underway Pulse, Salty Dog Lab Lookout On The Move! 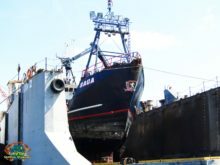 Saga, Captain Jake Anderson back in her old faithful shipyard, Deadliest Catch AK crab boats are used to going dry in Seattle at Northlake Shipyard. This Seattle shipyard has a sweet spot claim to fame and its their 50 Ton Whirley Crane on Rails, she’s a big girl and no joke this crane can do it all. Saga, Captain Jake Anderson, Deadliest Catch, Seattle Shipyard, Spring Dry Dock, Hurry up and go time…. 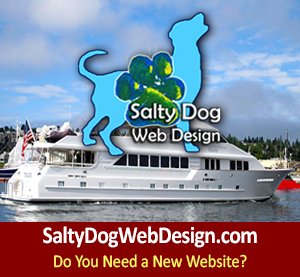 Photography By: Salty Dog Boating News, Salty Dog Maritime Marketing, The Pacific Northwest to Alaska Marine Traffic Underway Pulse, Salty Dog Lab Lookout On The Move! God Bless our fishermen and their families at sea and on land PNW to AK!!! 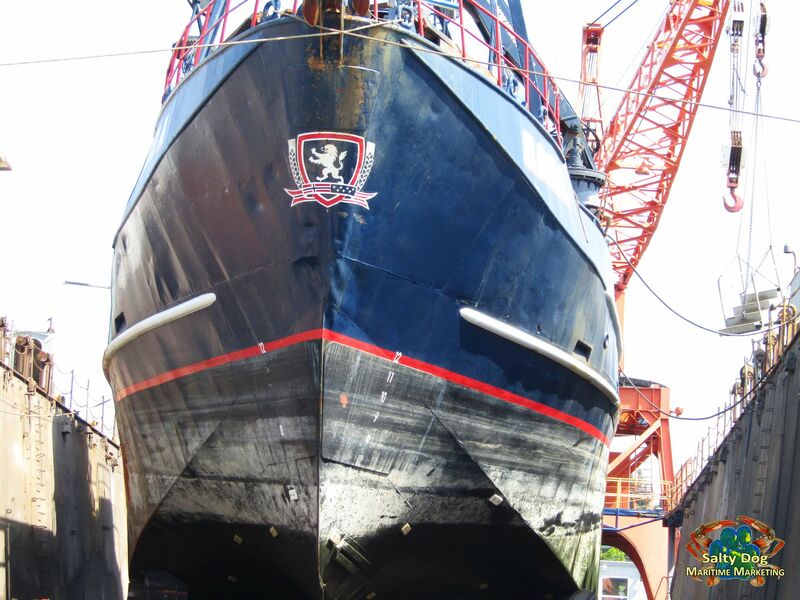 Saga, on the hit Discovery TV show Deadliest Catch is back for her annual time in the shipyard at dry dock. Shipyard time means time is ticking fast and the boat owner is bleeding cash, work order lists need to get done yesterday and all hands on deck to get projects done. 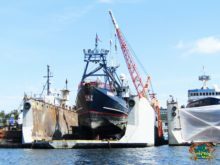 Its spring in the Pacific Northwest and the greater Seattle region is sprinkled with Alaska Bering Sea Crab Boats and commercial fishing fleets rush to get ready in the spring for summer salmon tendering throughout Bristol Bay (My Fav. Naknek, the good old Nushagak!) and Southeast Alaska, tenders will either be in town on stand by or the big ‘v’ deep draft girls get to spend most of their summer on the hook in hurry up and wait mode! 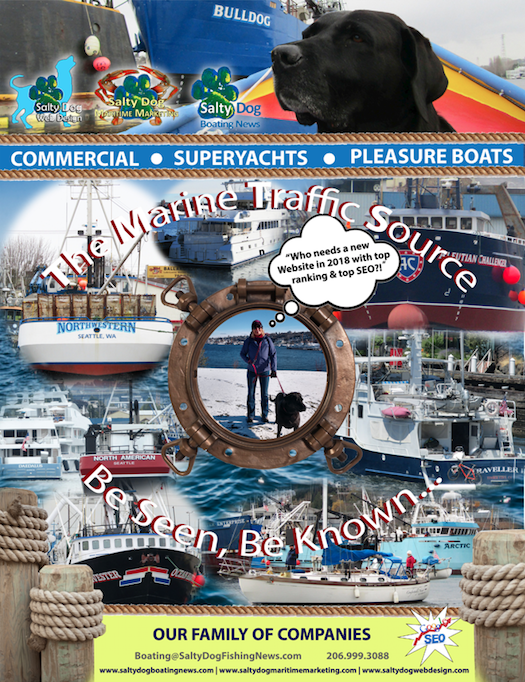 SAGA, Deadliest Catch, Salty Dog Boating News, Salty Dog Lab Lookout, Zippy Skiff Fun Spring Action, Doing It…. 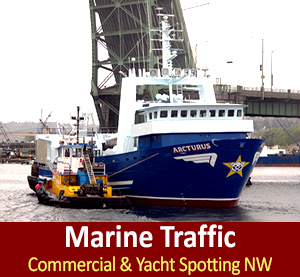 Photography By: Salty Dog Boating News, Salty Dog Maritime Marketing, The Pacific Northwest to Alaska Marine Traffic Underway Pulse, Salty Dog Lab Lookout On The Move! 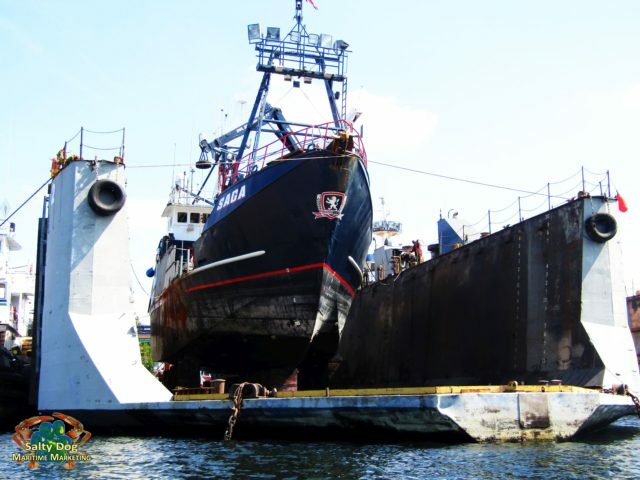 Deadliest Catch boats that frequent Seattle Shipyards include: Saga, Northwestern, Wizard, Brenna A, Cornelia Marie, Time Bandit although no longer with the show, and Summer Bay, for a short run right after Wild Bill bought the boat. Summer Bay spent the summer at Pacific Fishermen Shipyard getting her shave and a haircut major makeover, then the F/V Summer Bay loaded her crab pots on deck over at Fishermen’s Terminal and she was off westbound to the Ballard Locks for a drop into the Puget Sound where Wild Bill ran the Summer Bay uphill – and that’s where she be! 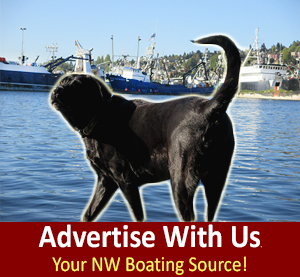 Salty Dog Boating News, Salty Dog Maritime Marketing, The Marine Traffic Commercial Fishing PNW to AK Source, Go Big or Go Home! Deadliest Catch is still going strong in season 14, who knew watching guys on deck and at the wheel doing the same thing over and over…. would last this many seasons with viewers. Thank heavens, most of these fishermen on Discovery’s Deadliest Catch have used their fame, promo’s and exposure for the greater good such as charities, fundraisers, and awareness for areas on need. 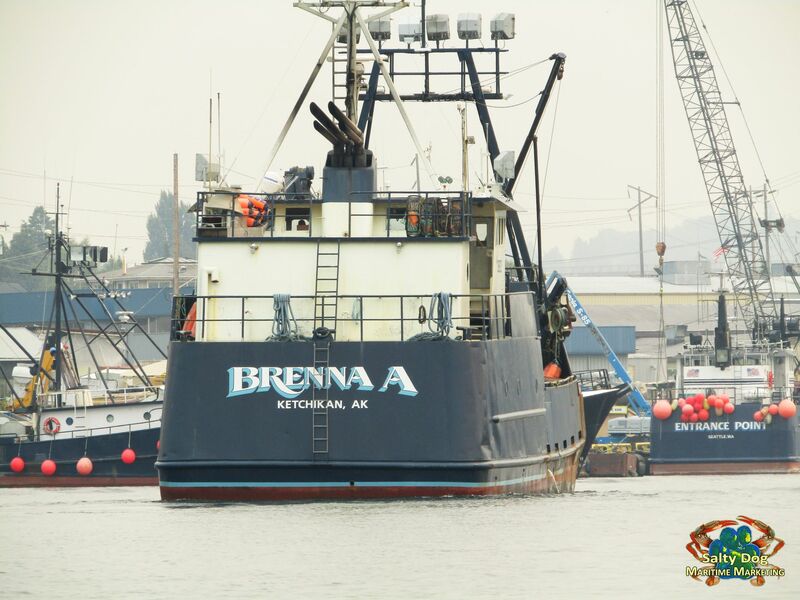 F/V Brenna A. has certainly taken their cause with ALS; while raising exposure to the next level with huge amounts of greater good for those affected by the awful disease ALS that Pat Dwyer lost his battle to in June of 2013. Way to go Dwyers, way to ‘Lead By Great Example’, yes ya’ll – I said it first about this family back in 2013, I was awwwww…. stuck by Sean’s family story as he told me about his tough Dad when I was standing on the deck of Brenna A. in the winter of 2013! ‘Leading by great example….’ – it’s part of a scripture. The bible calls us to do all things for the greater good and lead by positive example! Do it! 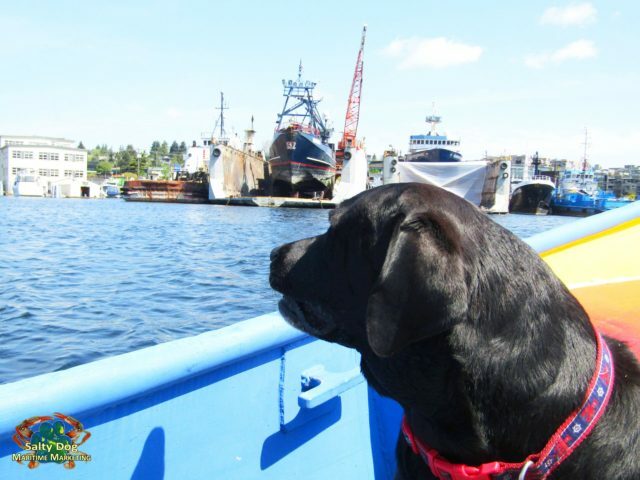 Saga, AK Crab Boat, Seattle Shipyard, Dry… Go Time! Commercial Fishing Boat Photography By: Salty Dog Boating News, Salty Dog Maritime Marketing, The Pacific Northwest to Alaska Marine Traffic Underway Pulse, boating@saltydogfishingnews.com visit: www.saltydogmaritimemarketing.com Salty Dog Lab Lookout On The Move! God Bless our fishermen and their families at sea and on land! Brenna A. Captain Sean Dwyer, FIGHT ALS!!! 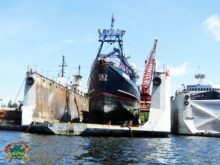 Deadliest Catch Crab Boat, Seattle Shipyard on the ways going dry! RIP Pat Ford Dwyer, End ALS, Help the Fight Today!!!! 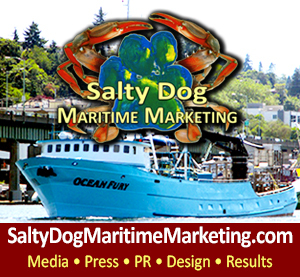 Photography By: Salty Dog Boating News, Salty Dog Maritime Marketing, The Pacific Northwest to Alaska Marine Traffic Underway Pulse, Salty Dog Lab Lookout On The Move! 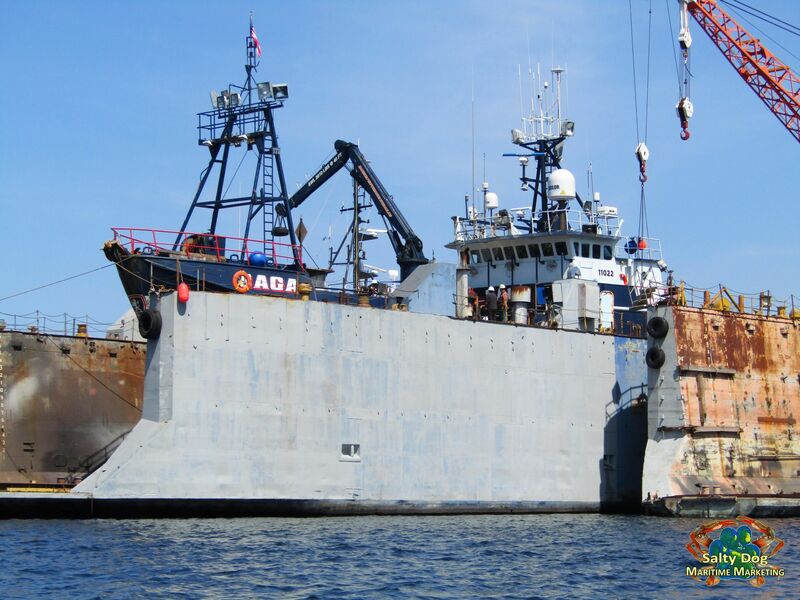 Help Fight ALS – Join F/V Brenna A. Today! EAT FRESH – BUY WILD!